It is begun!!! The first round theme and match-ups for Wyrd’s Iron Painter 2015 painting contest have been announced! Iron Painter is a painting contest run by Wyrd Miniatures; this contest varies from most painting contests in that it has multiple rounds and each round there’s a theme and all of the entrants are paired off in head-to-head match-ups, the winner of each pair advancing to the next round and the last painter standing at the end of all rounds crowned the victor. Competitors are encouraged to complete entries for each round even if they have been eliminated and any painter who manages to complete an entry every single round received special recognition (and chances at prizes!). Full details on the competition are available on Wyrd’s website. So I am back from covering the GW store in San Antonio and am taking over a Houston store tomorrow! While I was in San Antonio, I finished up my first unit of six minotaurs. More minotaurs will be coming eventually, just gotta clear the decks of a few more projects. Still working on photographing my miniatures; getting a tripod would probably help this. And speaking of upcoming projects, I think I have decided how I’m going to go about making my Thunderwolf Cavalry for my Space Wolves. I will keep you all posted and post some step-by-step pictures of the conversion. What’s that coming out of the woods!? Oh noes! 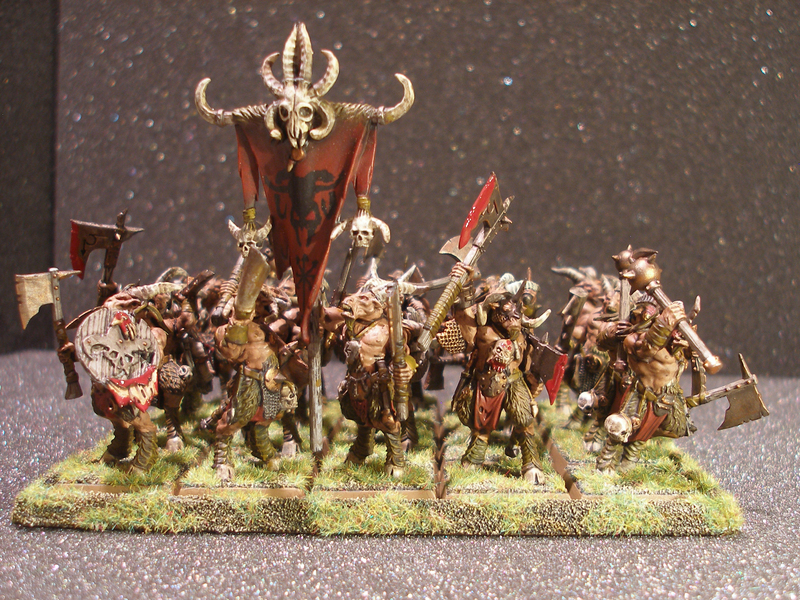 It’s my latest completed project–a 20 man Gor Herd for my Beastman army!